Just seven days left in my One Zentangle a Day self-imposed challenge and what a trip it has been so far! I can’t believe I have completed Thirty-six tiles and almost just as many practice journal entries. It has been great to go back and review all the tiles I have made over the past couple of months. It has been an amazing journey. This section of the book from “One Zentangle a Day” explores all the creative ways you can continue your Zentangle journey and day thirty six marks the first day of this creative exploration. Today’s tile(s) explores the possibilities of creating “Ensembles”. Ensembles is simply a group of tiles placed together like a puzzle to create one larger Zentangle tile. Traditional ensembles uses nine tiles, however my approach to creating my ensemble was to limit it to just four tiles placed side-by-side. To start, I used temporary glue dots under each tile and placed them side-by-side to keep from moving around too much as I drew ‘string’ across all the tiles. I then proceeded to fill each area of the individual areas of all the tiles and was careful to carry tangle patterns over to the next tile. In selecting my tangles, I was encouraged by the book to use two somewhat new tangles “Zander” and “Stickers”. Stickers was an entirely new tangle for me to learn, but Zander was something that I used in the past when I first began tangling. Since this was my first ensemble group, I wanted to keep the accompanying tangles I used to be very simple. I choose easy tangles like Knightsbridge, Holibough and Isochor to fill in the larger areas and filled in smaller areas with Tipple. To finish, I took the most time to shade each area to give illusion of depth and character. 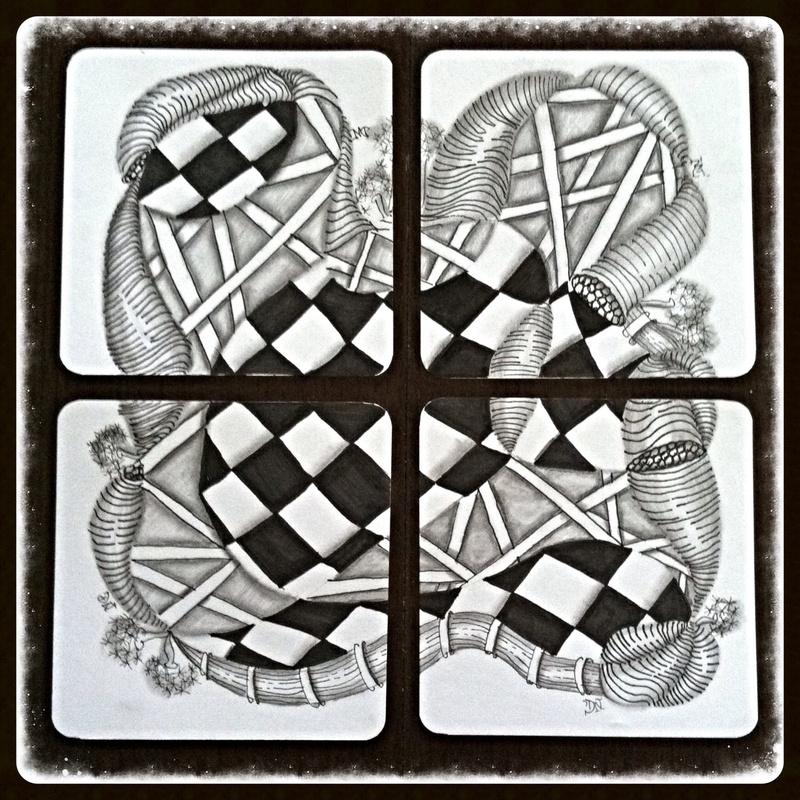 At the end, I was very excited to put all of my tiles together to complete this Zentangle ensemble art puzzle. I loved the final result and this technique of creating “Ensembles” will definitely add to the many different ways I can create Zentangle artwork.